Yep. I did it again. Found yet another time-waster. 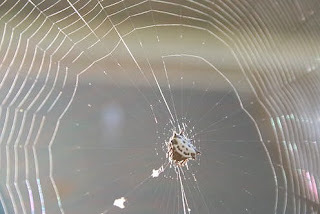 This one's not on the web. I was feeling sorry for myself because I can't get the new Sim Societies computer game, since my computer isn't smart enough or fast enough for it (even if it isn't a year old yet). And I saw a different, older video-game that the computer IS fast and smart enough for. And I bought it. THE MOVIES. I get to run a movie studio and make movies and create stars and it's way too much fun and addictive... Anyway, I'm still here, and still working, believe it or not. Hmm. I haven't posted since Thanksgiving, have I? Well, we had a good holiday. The boy came down from university for the weekend, with his dog. It got cold. It rained. The dog got a bath, and went right back outside and got in the mud. (sigh) She's a sweet dog, though. We ate too much. I did not make a pecan pie, but an apple crisp, besides the cheesecake for the menfolks. I thought the apple thing might be better for me than all that pecan gooey goodness. Once I get Asker's story to proposal format, I'll go back and work on revising Devil in a Red Dress. But I have a busy weekend ahead of me, first. Do you know how hard it is to find children's picture books that have pictures of Actual People doing things? People, not animals dressed up like people. We decided to have a book birthday for our autistic grandboy, and I went looking for books with people in them. He's working on verbs and on gender, so books with pictures of boys and girls doing things like running, swimming, whatever, would really help. But they have to be Real People, because he's very concrete and literal in his thinking and can't relate dressed-up animals to people. And it was Really Hard to find anything. I found a book of Fischer-Price Little People at the various toy-places you can buy for them--at a farm, the fire station, a gas station, etc. They're cartoon-y, but they look like people. And I found a "going on a picnic" book I thought would work. There were a few other books but the illustrations I thought leaned a little too far to the abstract, and some had just girls or just boys. All the rest were animals. I couldn't resist the book about how George Gershwin wrote Rhapsody in Blue--yes, there really is a picture book about that, and it comes with a CD of the music. The boy loves that music, from Disney's Fantasia 2000--hums and sings it, makes pianos out of blocks to pretend to play it. And the other day, he asked his mom for Rhapsody in Purple. So of course, I had to get him the book. Late Birthday? Or Early Christmas? So we went to this auction at a bed & breakfast in town that apparently floundered into bankruptcy. They were auctioning off all the furnishings, a couple of classic cars, the house itself, as well as another a couple of blocks away--all sorts of fancy stuff. I may have mentioned before, the fella has discovered a passion for auctions, so we went. Both days. I intended to go downtown and get me a signed Firefighter's calendar, since we were in the neighborhood, but I just flat forgot, which aggravates me no end. I think maybe I'll see if they have some extras at the bookstore one day this week. Anyway, if you'd asked me a week or so ago, I'd have told you there was no such thing as a house that's too big for me, but both these houses for sale fit that category. They were just too darn big. Neat, old houses, but way, WAY too big for me. We did come away with a couple of purchases, one each day. There's a bit of a history to one of these purchases. I've wanted a rug for my side of the bed for a while. I've brought three different rugs home from the store-- the first two didn't look right and the third, the fella didn't like the way it felt when he stepped on it. So I threw a little bit of a hissy fit (what? Me???) and said I'd take this one back too, but he was going to have to help me find a rug we both could live with. Oh, and I wanted a rug for the living room too. Well, amongst the things for sale were a whole bunch of handmade oriental rugs. 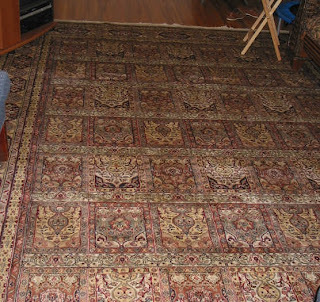 Admittedly, we don't know a whole lot about the rugs, but the prices they were getting for these great big, all-wool, or wool-and-silk rugs weren't much more than what you would pay for a rug from Home Depot. And they were a lot prettier. So we bought one. A great big one for the living room. Then we went back the next day, and bought another one for the bedroom. 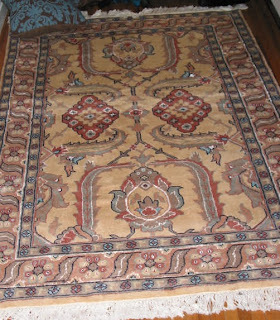 Both the rugs were made in India, the big one in Kashmir, and the little one in Agra. The bedroom one has a lot of silk in it and is very cushy on the toesies. I thought about going to the beach today to walk, but it was seriously foggy out pretty much all day today. It sorta, kinda cleared off around noon-ish, but fogged in again by 1:30. And I just didn't feel like walking on the beach in the fog. We have no beach report today. I have typed in the synopsis for White Elk, and am in the midst of revising chapter 3, switching the point-of-view in the first part of it so it's all in the hero's POV. I think it's working rather nicely. So, I was in the kitchen this morning, putting together a pot of carne guisada to have for Sunday dinner, and the jalapeno I was cutting up for it seemed to be particularly seedy. This is an important observation when it comes to jalapenos, because the vast majority of their heat happens to be in their seeds. Then it occurred to me to wonder where, when and why the word seedy came to mean disreputable, disheveled and possibly dishonest. A pepper having many seeds--or any other fruit with lots of seeds--didn't seem to be the proper source. Then I remembered when I had a vegetable garden years ago, and how if I wasn't careful, (especially in the heat of a Central Texas spring) the lettuce and carrots would "go to seed." They would send out these lanky, weedy-looking seed shoots, the rest of the plant would take on a bedraggled, shop-worn (or maybe sun-and-heat-worn) appearance, and the leaves (for lettuce) or roots (for carrots) would become bitter. I never did get a decent carrot out of that garden. And I had to step lively--and plant the lettuce practically in January--to get some nice salad greens. Seedy, meaning bedraggled and disreputable, has been around long enough that it likely came from original English-from-England, but lettuce goes to seed there too. (Just not as fast.) That has to be the original source of the meaning. Aren't words interesting? Well, they are to me, anyway. Haven't been walking at the beach lately. The fella went fishing with a friend on one of the jetties yesterday, though, and they each caught a fish. The fish swam up into the rocks, and they had to climb down a little to pull them out, but they caught them. We went over to Mike's house to eat them, because he volunteered to cook them up, and they were really, really good. (One of the fishes was big enough for two.) I do like fresh fish. Some people march on, but I happen to be slogging. It's a slogging kind of month. Or something. Lots of people are participating in National Novel Writing Month this month, or NaNo. I've sort of attempted this in the past. Problem is, I do my first-draft writing in longhand, so if I wanted to do an "official" NaNo, and get my words logged on the Official Website, I would have to first write, then type, then do the upload/count-y thing, essentially doing twice the work of anybody else. And I'm too dang lazy for all that work. My other problem is that I'm a slogger, not a sprinter. I do best at a "slow and steady" sort of pace. Six to eight pages a day, every week day. EVERY weekday. Sometimes, like when I haven't been writing for a while, I don't make it to six pages, but if I really work at it, I can do it. That gives me the 50,000 words NaNo wants in about 6 weeks. Which brings us to my other other problem. I write long. At least when I'm writing fantasy, I do. Each one of the Rose books came in at just under 150,000 words. (Okay, Eternal Rose came in a fair bit over, but I got it cut!) So did New Blood for that matter. That's THREE books' worth of writing, if you count 50,000 words as a book (and that's how long my Desires were, when I was writing them). Anyway, I'm still slogging. This week, I finished the synopsis for White Elk, Red Sword. * I also finished the world-building and character development for the science fiction/gene-splicing story, which I am tentatively calling Catching Time. Of course, the world-building will continue to develop as I get into the story and figure out other things I need, but it feels good enough I can work with it. I need to type in the world-building stuff, so I have multiple back-ups. Pen and ink can also be lost/destroyed. Then I can go back and type in the synopsis, and edit it as I do. Type-in is my 1st edit, giving me a second draft on the computer. Then--maybe this weekend, maybe starting Monday, I can rewrite the opening of Chapter 3 for WERS, putting all of it (at least so far) in the hero's point of view, and it just might be ready to ship out to the agent. I want to pull together a partial of Catching Time after that, and after that--we may be into the new year, when I think I need to go back and work on Devil in a Red Dress. I also need to write another 25 pages or so on Thunder. I might actually get them done before this month ends. We're not going anywhere for Thanksgiving. It will be a small gathering here on the island, but the weather promises to be gorgeous. It is right now, anyway. Beach report: I've only gone down to walk on the beach once this week. It was quite warm, and I wish I'd gone in my flipflops so I could have walked in the water. But I didn't, so... Lots of little rocks and broken shells along the high-tide mark. Lots of sea gulls. I did pick up my Bird Book when we went back to Clarendon. 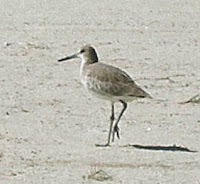 I now know that the larger of the sandpiper-like birds are willets, and the little flocking ones are sanderlings. 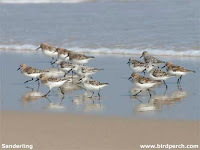 I'm looking forward to seeing them in their summer plumage. I walked in my neighborhood one day--the day the cold front came through. I thought about walking the other way, around by the bayou (which is actually more like a big opening to the bay than it is like a bayou, but that's what they call it so...), but the wind was really whipping, and it was cold, and coming off the bayou it would have been even colder, so I stayed on the residential streets. Okay, I've driveled on long enough. Time to stop this and go do something useful. Or play Mah-Jongg... Whatever. *Title subject to change, if it ever sells/finds a publisher. Got some totally cool news today. The Eternal Rose has gone to a second printing. Okay, so we drove, like, a bazillion miles this past weekend. When I say--well, actually, it was probably only 1400 miles--you will understand that the distance between 1400 and a bazillion actually isn't that great, especially from the pov of the person actually experiencing driving all that distance in one weekend. It's not actually that far to drive to Clarendon and back--about 1200 miles. The extra 200 come from discovering that the Broncos were playing Quanah for the district championship for the first time since we moved to town, only they were playing IN Quanah, which is 90 miles away. So--despite the fact that we had already driven through Quanah once that day--we hopped back in the vehicle and drove Back to Quanah to watch a 1A high school football game. I also got to visit with a bunch of friends while we were there, who we wouldn't have been able to see without going to the game. And then the Broncos lost. Because the new town is so much larger, it's not de rigeur to go to the Friday night football games here--but it still feels weird not going. We spent a LOT of years going to the game every Friday night, because we either had a kid in the band or playing football or both. It was pretty cold. We didn't take our seats, and the metal bleachers were definitely cold. Daytime temps are pretty much the same on the coast or in the Panhandle, but the temp drops a whole lot more at night up north. No moderating influence of the water. I'm trying to figure out plots now, and I think I want to rewrite Chapters 2 and 3 of White Elk from the opposite point of view. I'm also having to think about bad guys--what they want, what they're doing that the good guys can stop them from doing, and it's tough. I think I'm going to have to do that "think up 20 things to happen here" exercise, because there are just too many possibilities. I have to pick some things--that will need reasons for them to happen--and then the next events will lead from that. I'd rather be writing, but if I don't know what's going to happen, I'll be writing in circles, and I don't fly well into the mist. I need my roadmap, and I'm having trouble deciding where it needs to go. The bad guys are in New Mexico. This limits some of the things they can do. They have evil witch powers of several varieties and are of several ethnic backgrounds. This expands some of the things they can do. They want power, because they want to do what they want to do without anybody stopping them or crossing them, and they want money because money provides power. Power feels good because it means they can do anything they want to anybody--they're the boss dog. Taking stuff from other people proves their power, and taking a life is the ultimate power trip. So. This is where my bad guys are coming from--and now I have to figure out what steps they're taking to acquire more power. What EXACTLY are they doing? How are they going about acquiring this power? Ugh. What do you think they ought to be doing? 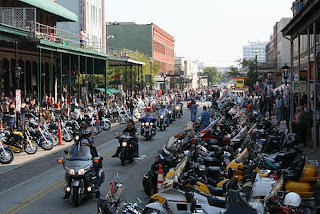 So there was this big biker rally in town over the weekend. The population swelled by about 400,000 (a little less than expected), lots of noise, lots of people, but only two people died, and not on the island. Not even many arrests, which was nice. Lots and lots of gorgeous bikes. Lots and lots and lots of bikes. They blocked off most of downtown, except to motorcycles, and set up all kinds of booths and stuff, and people paraded their bikes up and down the streets. Mostly the Strand. We went out pretty early on Saturday morning, because we wanted to park closer than ten blocks away, so the pictures are before things really started filling up. Lots of interesting people to watch. That's pretty much what I did over the weekend. We went out a couple of times--they also blocked off a stretch of the seawall, and had events in a couple more places in town, and I'm sure there were folks off on the beaches. There were campers parked all up and down the seawall, with people in their lounge chairs on the sidewalk, cooking in their little hibachis. Read a book or two. Probably more than necessary. Monday, the fella's cousin came by to visit while he was in town on business. Hadn't seen him in a very long time. So we got to talk, catch up on things, went out to eat seafood, etc. That was nice too. I think I've managed to get a partial written of my shaman and warrior princess story. Now I need to come up with a synopsis before I can revise and send it off. I sort of know what's going to happen, but not exactly. Guess I ought to figure it out, huh? All these trips out of town are messing up my schedule, and it's not likely to get much better before the end of the year. Anyway, the beach. Lots of little tiny rocks and shells. The half-inch size, mostly. Lots of gulls. I thought I saw a one-footer, but turned out, his other foot was just hiding. I collected 5 cans (4 beer, one diet soda), three bottles (one beer, one water, one soda), about 10 plastic bags, ranging from ziplock to shopping, a couple of bottle caps, 4 fast-food cups used for shaping sand castles (actually, I think one of them was a yogurt container), and a couple other pieces of sundry junk. I did not pick up the diaper, though I should have. But I didn't have a picker-upper other than my hands. Ick. I took a plastic shopping bag with me, because I've often intended to, given that I pick up trash anyway, and this way I could pick up more. I emptied it out once, and re-filled it. Then I walked back to my car along the sidewalk, so I could knock most of the sand out of my shoes. And I encountered some people I knew whilst walking on the sidewalk, which was a first. There was actually a lot less trash than I expected. The weather was gorgeous. We haven't had rain for a week or so. (And I forgot to water my ginger, even though I'd brought it in, and I'm hoping I haven't killed the poor thing. It looks as if it might, sorta kinda, recover.) But we're expecting another cold front today. I'll try to get back this week, but don't know if I will. The rest of the week looks REALLY busy.